The inspiration for this article comes from an Old Testament story. In this story there is a special building project undertaken by Solomon. The four stages explained in this article are the exact same steps illustrated in this story. You will find that these four concepts will dramatically help you in your music ministry. You need to take this information and start creating an overwhelming positive worship experience in your church’s worship service. This is where we begin – One day as I was reading the Bible I came across and amazing scripture. Solomon’s temple was completed and the priests were ministering and then God’s glory filled the temple. The awe and reverence caused everyone to stop and let God inhabit the worship. Looking back I realized that there was a lot of hard work and preparation that needed to happen. The nation Israel needed to come together and build the temple. It all started with a vision from David. He desired to build a temple that was worthy for God. But, he could not because he shed too much blood in his lifetime. The torch was past on to his son Solomon. Then I noticed that there was a distinct pattern regarding the various stages of the project. And the pattern fits no matter what kind of building project you start. I want to show you how it applies to your music ministry. The metaphor of building a house is appropriate in the fact that it gives you a visual model to help understand how to build your music ministry. And you can apply this basic principle to make vast improvements in the way you minister to the people you serve. With all this in mind let us look at the four major steps toward building an awesome music ministry. There are basically four major milestones whenever a building project is undertaken. These four milestones insure the success of the project. You can take these proven principles and apply them to your ministry. Here are the four major areas..
1) Have a Blueprint to guide your course. You need to know and understand the final outcome. You need to determine the real purpose and goal for doing what you do. A blueprint will help guide and direct your path. The benefit of doing this is you will be able to predict the outcome with a great deal of accuracy. You will have a roadmap and compass that will guide you though the process. You will be able to make adjustments to the way you are doing things now. Obviously, a solid foundation is perhaps the most important aspect of a building. As a Christian you must stand on a good foundation. You need a relationship with God that is built on truth. And you need to nurture that relationship. A Solid Foundation insures that you get off to a positive start. A weak foundation can only end up in ruin. Whenever a carpenter, mason, contractor builds a house the success of that project depend on having the right tools to build the house. As someone who uses music to minister to the people you serve, it is important that you have the right tools also. There are several factors that will help improve you presentation and delivery of the message you are responsible to give. You need to be skillful in the things you do. Remember it is God who is working through you. God is not mediocre and neither should you. After all you need to realize that Christ dwell in you. With the right tools you can dramatically improve your ministry. 4) Moving into the house. When Solomon’s temple was completed and the people began to worship and amazing event took place that is nothing short of phenomenal. God’s glory filled the temple. I truly believe that when God is in the midst of our worship it is nothing short of amazing. I think you will agree with me that when everyone is in the right frame of mind and heading in the same direction, with the blessing of the Lord, nothing is impossible. Include having the Creator inhabit the praises of His people. What makes this process better is that it is based on solid Biblical principles. These principles have proven to be the best way to start and fulfill the commission. It is illustrated by the awesome task undertaken by Solomon to build the Temple. Scripture further reinforces it. Furthermore, what makes it better is that is simple. Have you ever noticed that the most profound things in life are often rooted is simple easy to understand ideas. I feel that I was blessed to share this information to help build the body of Christ. My vision is to see as many people as possible experience the moment when God’s Glory fills the temple. It gives me goosebumps just thinking about it. 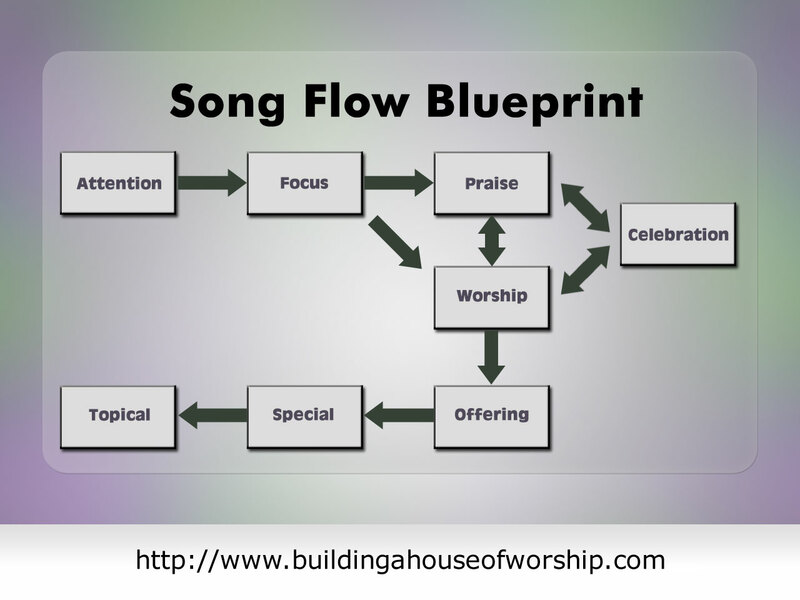 The worship flow blueprint chart explains how to move from song to song during a church worship service. 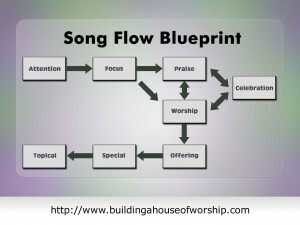 For more detail on how to use this chart go to this page: Christian Music List.